Home »	Patient Stories »	Doug B. It was into a 32-mile run that traverses three 6,000-foot balds in the Western North Carolina mountains that Doug Blackford realized a unique parallel — he had just completed his 32nd proton therapy treatment for prostate cancer. A quick check of the list of side effects for radiation therapy quickly reveals why an extreme run more than three-quarters into a cancer treatment regimen is not to be recommended. They include incontinence, abdominal cramping, diarrhea and fatigue—among others. Proton therapy isn’t your average radiation. Many patients choose proton therapy to avoid long-term side effects that often accompany surgery, brachytherapy or conventional radiation. In a recent survey of prostate cancer patients who had received multiple types of treatment, proton therapy patients reported much less occurrence of the long-term incontinence and impotence that other patients cited. 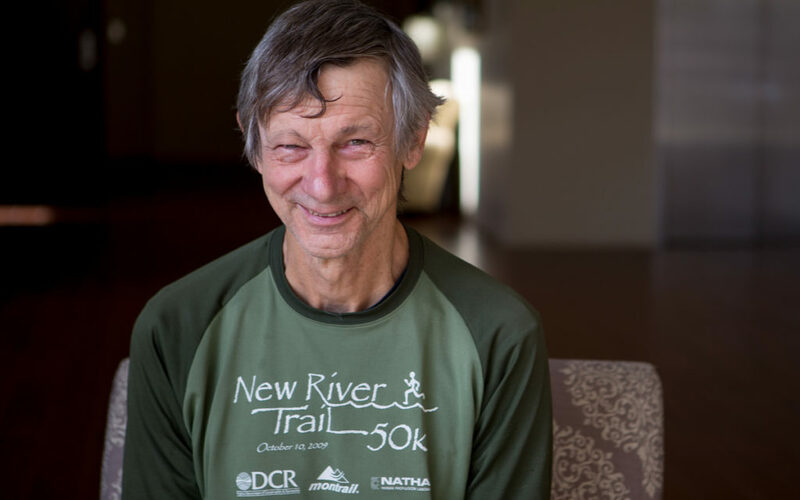 Mr. Blackford, 69, launched his career as an ultra-marathoner in his 50s, initially to support his teenage son who had started cross-country training. “I would say, ‘Go running.’ He would say, ‘I don’t feel like it.’ And I would say, ‘Let’s go run,’” Doug said. “After two miles I almost threw up.” He persisted, and after a few months found himself genuinely enjoying the activity. He joined a running group, and at the end of February, he will run his 15th annual Mt. Mitchell Challenge, a 40-mile trail race to the top of the tallest peak in the Eastern United States—and back. Doug says he often finds himself alone in his age group, or duking it out with a couple of others. During his treatment, he maintained his regular running schedule while staying in Knoxville for treatment. The fact that he realized he ran 32 miles following the same number of treatments was simply coincidence, an observation he enjoyed sharing with his friends. And then Doug Blackford just kept running.